Go for the glow. 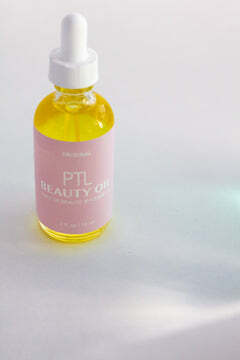 This is our essential, unscented and all natural multi-purpose everywhere beauty oil. Formerly known as Madge, short for Magic, this bottle of liquid skincare gold has become our staple top shelf beauty product, the foundation of an effective and simple ritual. The fragrance and filler free makes it suitable even for sensitive skin. Deeply nourishing yet mysteriously lightweight, our organic beauty oil rejuvenates skin visibly in minutes for a glowing, healthy complexion. Also works as a body and hair oil. 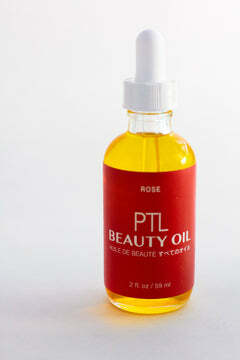 How many ways can you use our beauty oil? Filler-free, alcohol-free powerhouse blend of argan, camellia and sweet almond oils revive dehydrated skin and nourish with Vitamin E and Vitamin A, antioxidants, and fatty acids. Sweet almond oil (organic): Rich in Vitamin E and D, minerals and fatty acids, sweet almond oil has long been a favorite skincare treatment for its ability to absorb deep into the skin to keep it glowing, healthy and soft. Also works to improve circulation and skin texture. Argan oil (organic): Organically grown in Morocco, this premium oil is lightweight yet deeply hydrating, helping to moisturize dry skin and balance oily skin. Full of natural antioxidants, argan oil is known for its anti-aging effects. Camellia oil (organic): Extracted from the seeds of the green tea plant, camellia has many of the same benefits as green tea. It's a powerful antioxidant, with a high content of Omega 9 oleic acid, absorbing quickly into the skin to hydrate, protect and nourish for the long term. Deeply nourishing and rejuvenates skin - and your mood - instantly. 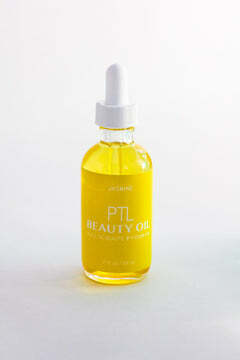 Our nutrient-dense multipurpose beauty oil meets the intoxicatingly sensual scent of jasmine. This simple yet effective formula contains our 3 organic luxury oil medley and pure Jasmine Grandiflorum Absolute, leaving a trace of the floral scent known throughout history as the king of flowers. Jasmine is also widely prized for its soothing and brightening properties on the skin. Filler-free, alcohol-free powerhouse base of cold-pressed and organic argan, camellia and sweet almond oils revive dehydrated skin and nourish with Vitamin E and Vitamin A, antioxidants, and fatty acids. Jasmine oil: Extracted from thousands of hand-picked jasmine flowers, this super potent oil soothes, hydrates and brightens skin tone while leaving an intoxicatingly sweet and lingering scent. 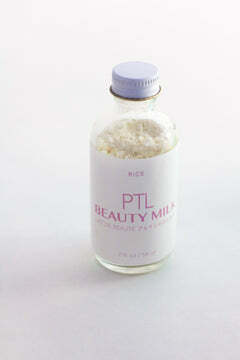 Beauty milk is a skin brightening and soothing skin treatment that can be used any way you want. It's a 3 in 1 daily cleanser, exfoliant and treat yourself mask that leaves skin baby soft and smooth for a radiant, healthy canvas. Made of two star ingredients: milk and rice, along with a medley of exfoliating ingredients including super fine ground almonds, barley flour and kaolin clay to exfoliate without drying. Activates with water, toner or face oil (including Beauty Oil) of your choice. Our essential brightening and soothing rice milk beauty polish gets a super boost with strawberries, for extra skin toning and balancing made for oily or combination skin types. Smells like a strawberry milkshake (mmm!) 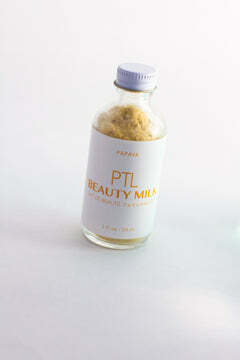 and can be used as a cleanser, exfoliant or mask. French pink clay: Works to slough off dead skin cells and to create an overall refreshed appearance. 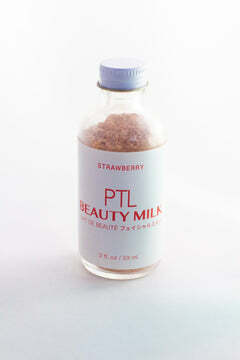 Gives this beauty milk its bright pink colour, naturally. Ptl (petal) is a store and design studio making new essentials. We launch products, one at a time.